GET PREPARED! Test your knowledge with our comprehensive practice tests. 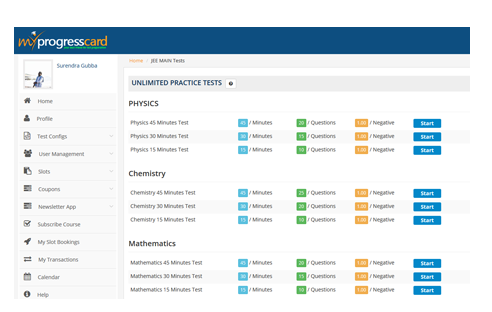 myprogresscard.com’s practice tests cover all the topics. You are 5 times more likely to pass the test after taking our free practice test. Start taking JEE Online Practice Tests with MPC and analyze your performance, identify your strong & weak areas in desired subjects. Few steps away to take practice test and get detailed analysis. 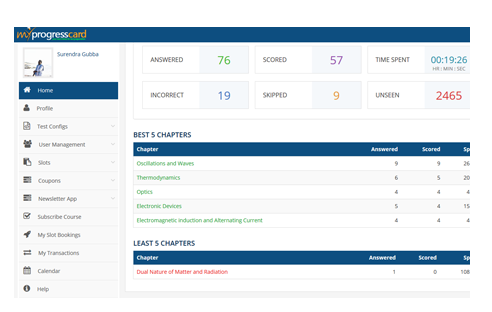 MPC reviews your performance displaying Attempted Questions, Correctly Answered, Negative Marks and Overall Score. After the practice session, you can also get access to the answers so you can work on them accordingly. Benchmark score in JEE MAINS is possible when practice is done on right type of questions and that too in large numbers with right practicing platform. MPC comes with large sorted in-built question bank, which covers nearly 1 Lakh+ Questions ranging for JEE MAINS. 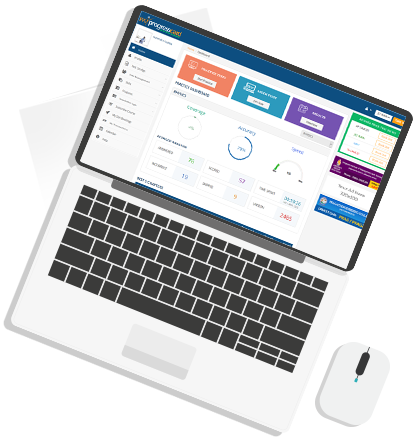 MPC’s question bank is designed and developed by educational experts, who acquire vast experience with latest examination trends so as to deliver true value in exam preparation. 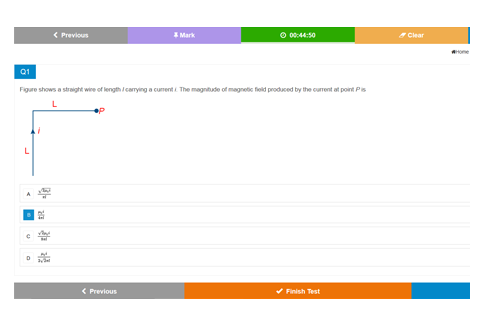 MPC offers a detailed feedback & analysis once the test is taken, letting users know their strengths and weaknesses. The graphical representation view on subject-wise & concept-wise is configured well. One can plan and fine-tune his/her preparation by working on those weak areas after taking tests. Insightful analytics also gives subject overview percentage, including overall attempts, correctly answered questions & secured score. Enjoy the unlimited practicing and instant feedback, which adds value for your upcoming JEE 2019 Exam. Get ready to face the actual Exam! 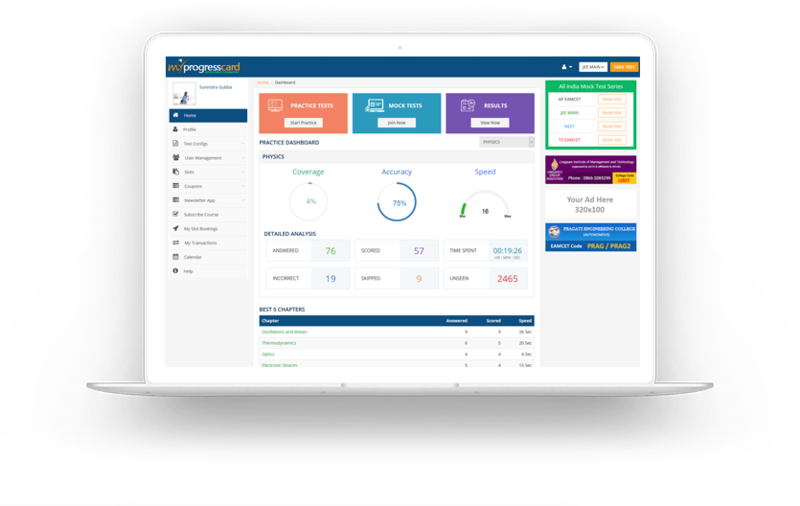 Unlimited practice sessions is what I like in myprogresscard, im now confident to face my JEE 2019. It’s very helpful practicing platform who can’t bear coaching & do self-study like me for JEE 18. Myprogresscard is helping me to regain my confidence and increase practicing skills. No doubt, it is the best tool available for JEE aspirants. Thanks myprogresscard! I can now practice for my jee exam on my own. Joint Entrance Examination (JEE) is an engineering entrance examination conducted for admission to various engineering colleges in India. The exam is of the objective is based on multiple choice questions. JEE Main 2019 offline (pen-paper) exam will be held on April 8 while the online exam will be held on April 15 and 16. JEE Main 2019 registrations has commenced from December 1 and will conclude on January 1, 2019.